The cattle barn is fully equipped for milking with an automatic milking system. There is a lot of attention to the comfort of the cow. The cows can completely decide themselves when they are milked. 24 hours a day the cow has a free choice to be milked, lie down or to enjoy a good meal which is freshly prepared every morning. 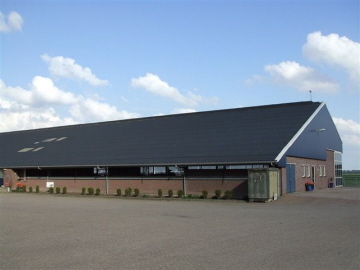 In addition, the roof is completely isolated and the sides of the barn have 2 meter openings. The openings are fitted with a curtain that automatically opens or closes, depending on wind speed and temperature. In summer it is pleasantly cool and in winter the heat stays in the barn. The berths are equipped with a rubber mat. These are cleaned every day and provided with a new layer of straw. There are manure storage facilities below the floor. The grids are kept clean with the JOZ-tech manure robot, which cleans the floors where the cows walk 8 times a day. The cows are no longer shaved in the fall, but they can brush themselves with a cow brush. 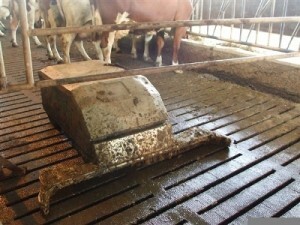 Some cows like so much that they use it almost on a daily base. Since September 2015 we have also extended our cow shed with an extra row of boxes. These boxes are for cows who are expecting within 6 weeks. Besides the boxes we also have created two strawboxes for cows and their young so they can be cared for more easily. And last but not least, like the potatoe barn and workshop, we have also put solar panels on the cow shed so when the sun shines we are ensured of our own electricity. 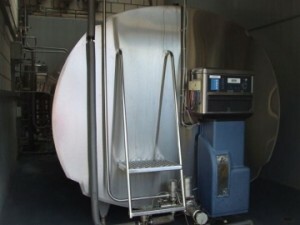 The milk is supplied to FrieslandCampina. The quota is 900,000 kg milk with a reference fat of 4.10%. 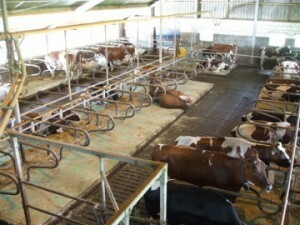 This quantity is produced by about 110 dairy cows. 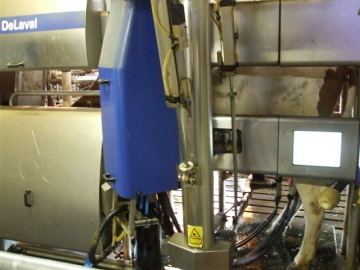 The production in 305 days is on average 8900 kg milk with 4.55% fat and 3.58% protein. Calving interval is on average 387 days. On land we cultivate grass, corn and wheat for our cows. The roughage is supplemented by feed concentrate and wheat yeast concentrate of Hendrix UTD. They also provide us with the ration advice. 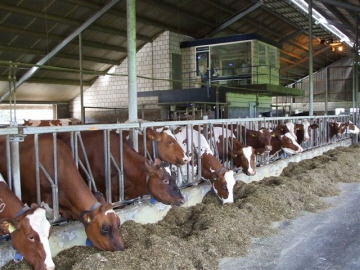 The ration consists of a mixture of grass, hay grass seed, corn, cracked wheat, wheat concentrate and yeast concentrate. Since 2006 every day freshly cracked wheat is fed and since the summer of 2009 wheat yeast concentrate is added to the ration. This has resulted in a significant increase of protein content. In 1978, we moved here from the province of Noord-Brabant and started with a dairy herd based on 100% MRY. However, after the introduction of the milk quota we have chosen for a bull ‘Red Holstein’. Currently we’re mainly using the bulls Canvas, Spencer and Red Holstein test animals. This sperm is supplied by CRV. They also carry out inspections of the cows, milk sampling and inseminations. On average, the cows are registered with 81.4 points. All the young cattle is fertilized by our own bull. This bull is replaced every three years. To ensure better public health, we use no antibiotics to treat our cows. Since September 2013 we have been using various products from Animal Health Vision.